Digging into the best hyaluronic acid serum reviews can be a real pleasure for a skin care enthusiast since one can find such positive reviews about a product that is among the most popular skin care products today. As we age our bodies make less hyaluronic acid, and as a result skin becomes drier, and fine lines and wrinkles begin to appear making us look older than we feel. In order to help fight the signs of aging and boost moisture levels in their skin that can delay the appearance of wrinkles and fine lines, many men and women find themselves looking for an effective hyaluronic acid serum. So, in order to help you choose a good hyaluronic acid serum to meet your needs, we will provide you with some of the best options available on the market today. OZ Naturals is a skin care company that is very popular among users due to its top quality natural and organic ingredients as well as its effective products. OZ Naturals Hyaluronic acid serum is 72% organic and some of its ingredients are Vegan Hyaluronic Acid, Witch Hazel, MSM, Jojoba Oil, Wild Crafted Green Tea, Vitamin C and Vitamin E.
Vitamins C and E are powerful anti-oxidants that prevent and reduce signs of aging while witch hazel acts as astringent to clean skin pores. Jojoba oil helps to reduce dry skin and Vitamin C serves to even skin tone and boost collagen. Contains no alcohol, parabens or sulfates. When applying this serum, it is best to wash your face first like you normally would, apply a thin layer of the serum and allow it to dry. Then, use a good moisturizer. The hyaluronic acid will help your skin better absorb the moisturizer. 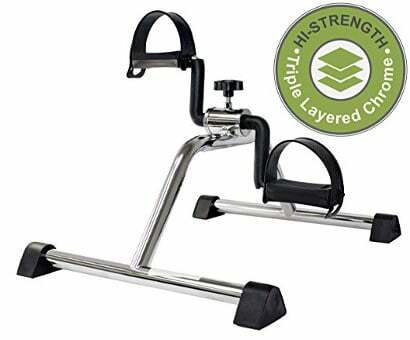 It is recommended that when first using this product, you start by using it once a day or every other day, and slowly work up to applying it morning and night if needed. Reduces wrinkles particularly under the eyes. Results in a slight tightening of the skin. We like the fact that this serum is mainly organic and that the few ingredients in it all perform a necessary function in reducing signs of aging. 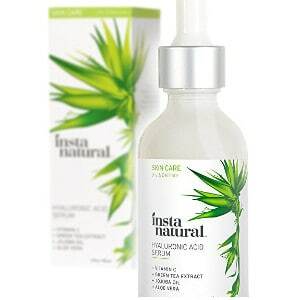 This is a very popular hyaluronic acid serum which contains effective anti aging ingredients apart from hylauronic acid such as vitamins C and E.
InstaNatural Skin Care is well known for its good quality natural skin care products and their hyaluronic acid serum is very much preferred by users who find it functional and efficient. Even if it seems impossible to find a full list of its ingredients anywhere, we were able to discover that it contains vitamin C and E, green tea, hyaluronic acid and jojoba oil. When using it, you only need to apply a small amount to the skin area you want it on, allow it to dry and then follow with the moisturizer of your own preference. No parabens, fragrances, additives or alcohol. Lifetime satisfaction money back guarantee. Softer and smoother looking and feeling complexion. While we wish that it was easy to find a full ingredient list for this product, we do like the ingredients we could find and the fact that it contains plenty of anti-oxidants as well as jojoba oil to soften and moisturize skin. Cosmedica Skincare Pure Hyaluronic Acid serum is another very popular hyaluronic acid serum. There are only three ingredients in this serum and these are: Hyaluronic acid (1%), distilled water and 0.5% of benzyl alcohol. It can be used alone and followed by a moisturizer or added to your regular moisturizer or facial cream. 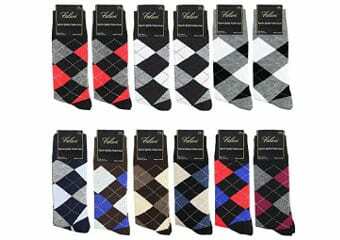 Can be purchased in 1 ounce, 2 ounce, or 8 ounce quantities. No dyes, fragrances or fillers. Brightens their overall skin tone. This appears to be a very good serum for those people who want a pure hyaluronic acid serum without any added vitamins or ingredients. People purchasing this product are likely to get more anti aging benefits if they also use some type of vitamin C cream in conjunction with it. Pure Swiss Hyaluronic Acid Serum is a serum that combines both hyaluronic acid and vitamin C in an effort to give users a more even overall skin tone and younger looking skin. The product’s ingredients include: Hyaluronic acid, Magnesium Ascorbil Phosphate (a form of Vitamin C), Sorbic acid, Benzyl Alcohol (delicate preservative authorized for use by BDIH & Ecocert), pure mineral water. There seems to be some discrepancy in the consistency of this product. Some users find that it is thicker textured than other like serums while others find that it has the consistency of water. This may be due to the difference in what reviewers expect from a hyaluronic acid serum. Comes in 0.5 ounce or 1 ounce containers. No parabens, formaldehyde, phthalates, petrochemicals or artificial fragrances. 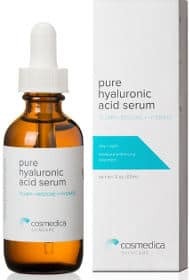 Reviews and ratings for the Pure Swiss Hyaluronic Acid Serum are quite good with some users feeling that this product didn’t keep up with their expectations. We like the fact that this serum combines both hyaluronic acid and Vitamin C. The light consistency that some people report is not necessarily bad since a light texture product can provide better application and absorption. 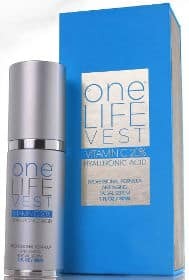 One Life Vest Hyaluronic and Vitamin C Serum is a nicely packaged product containing natural and organic ingredients. Hyaluronic acid with vitamin C makes a powerful anti aging combination and this product is a good solution for somebody that can’t afford to buy a hyaluronic acid and a vitamin C serum separately. 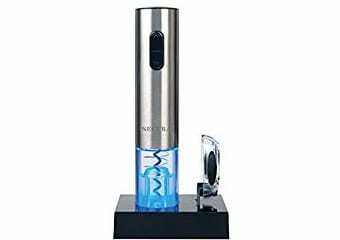 Also, the aluminum bottle ensures maximum sunlight protection while the pump provides effectiveness and prevents oxidization. 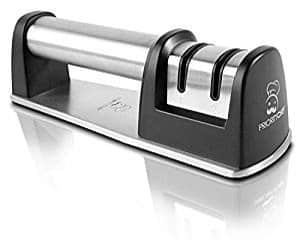 The pump is a particularly good option especially for vitamin C which tends to lose its potency easily. Other ingredients this serum contains are: Organic Aloe Vera, vitamin E, organic Herbal Infusion, Sodium Ascorbyl Phosphate, MSM, Witch Hazel, kosher vegetable glycerin, carbomer, L-Arginine, organic Jojoba Oil, phenoxyethanol, ethyl hexyl glycerin. 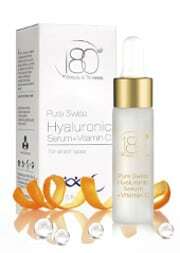 Contains botanical hyaluronic acid and 20% vitamin C.
Intensive serum suitable for face and neck use. Manufactured in the USA at an FDA approved laboratory. 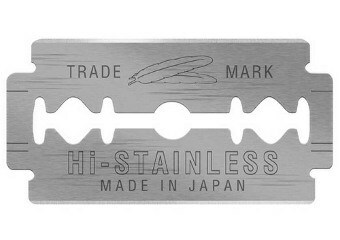 Free of parabens, fragrance and alcohol. Noticeable decrease in wrinkles and fine lines such as laugh or forehead lines. Makes skin smooth, even and bright. Good for blotchiness and big visible skin pores. The packaging, ingredients and great reviews make The One Lifevest serum a good option if you are interested in combining hyaluronic acid with vitamins C and E. Also, the fact that when you buy 2 bottles, the company offers you a third one for free is a deal worthwhile considering. Amara organics is a company specializing in quality natural skin care products, having a good reputation in the market and lots of loyal fans. 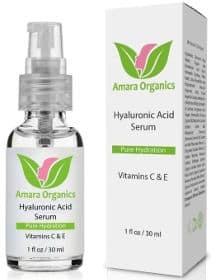 Amara Organics Hyaluronic Acid Serum is mainly a hyaluronic acid serum which also contains a percentage of vitamins C and E. Its ingredients are natural and plant based with some of them also being organic. It is also free of alcohol. Natural and Organic Vegan Moisturizer. 100% pure vegan hyaluronic acid. 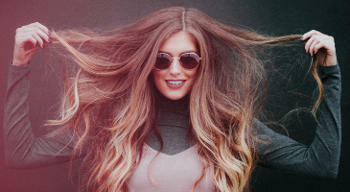 Free of parabens, petrochemicals, artificial colors, sulfates, phthalates and other harmful chemicals. What do the User Say? Fine lines disappear and deep wrinkles reduce. Feels refreshing unlike other similar serums that create a feeling of tightness. More firm and bright looking skin. Not greasy and absorbs nicely. 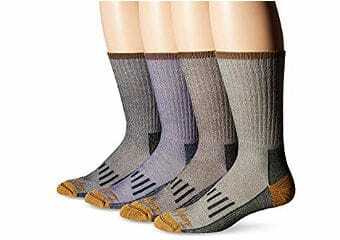 Great results at a very affordable price. Carefully picked and potent skin care ingredients are contained in Amara Organics Hyaluronic Acid Serum. Our only concern is that for the protection of vitamin C mainly amber colored or darker glass bottles are used to protect vitamin C from light. Still, based on the fact that Amara Organics creates some reputable natural skin care products which people seem to appreciate a lot makes a good reason for somebody to try out their pure vegan hyaluronic acid serum. In conclusion, keep in mind that even the best hyaluronic serum will take some time to work, so don’t expect to see an improvement in your skin overnight. However, many people do notice some improvement in their skin tone and a reduction in fine lines and wrinkles within two or three weeks of continued use of hyaluronic acid serums.